The Annual Goonies Day, June 7, is fast approaching. Why not plan to visit Astoria the weekend of June 9-11, 2017, for Shot in Astoria that celebrates not just The Goonies, but the other films made in the area. 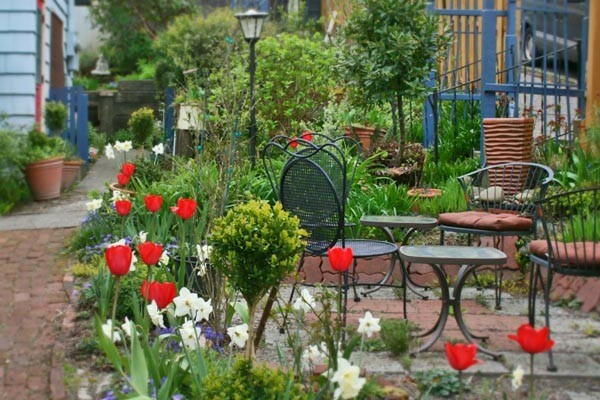 You’ll be on location in the heart of the action at Clementine’s Bed & Breakfast on Exchange Street. The Oregon Film Museum, the best way to start a “Goonies” tour, is just a two minute walk away. On the way, you’ll pass the Flavel House Museum, that appeared in the film. 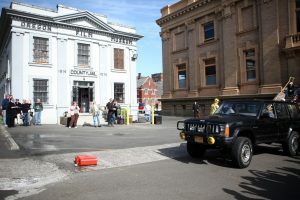 You should recognize the Film Museum as the site of the movie’s opening jail break. You’ll want to go in rather than break out, since the Museum was created especially to serve visitors with an interest in Oregon’s film heritage. You can see artifacts from The Goonies and other Oregon-made movies, and even make your own film. The Museum is open from 10 am to 5 pm daily. Visit the Museum’s website for information about Oregon films and movie clips. From the Museum, stroll the few short blocks to the foot of 6th Street or 11th Street, where you can board the Astoria Trolley (for $2, you can ride all day). If you wish, make a short detour to the Lower Columbia Bow (826 Marine Drive), alias Chunk’s Bowling Alley. Hop on the Trolley for a ride along the Riverwalk to the East End Mooring Basin at the foot of 36th Street (often used as a location for films). You’ll be right across from Columbia Baseball Fields, a good spot for viewing the ‘Goonies House’ at 35th Street. Please note the house is privately owned and not open to the public. Stroll along the Riverwalk toward 37th Street for another good viewing location for the house. A bonus from these vantage points is a view of the murals on Astor School, which you may recognize from the movie Kindergarten Cop. Cap off your tour at the same location as the film’s ending – Haystack Rock at Cannon Beach. It’s about a 40 minute drive down US 101 from our bed and breakfast. Visit the Goonie Day Facebook page for more information, and the schedule of events for Shot in Astoria. 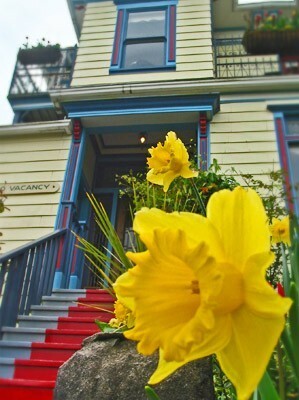 The annual celebration is the weekend of June 9-11 in 2017, but we welcome Goonies fans any time of the year, so just give us a call or go online to book your stay!